Yokohama YABAcious IPA is a 6.5% American IPA from Yokohama Brewery, based in Kanagawa, Japan. It was part of their entry into the 2017 Japan Brewers’ Cup, held in Yokohama, and since then, can be found on tap across Japan. There has been some change in the brewers, with Gojo-san moving on, so does Yokohama YABAcious IPA indicate a new direction for the brewery? And that’s all about we could find out about Yokohama YABAcious IPA. I promise to try and not make any jokes about Scobby Doo or Yabba-dabba-doo. Yaba as in yaba-dabba-doo or yabai? 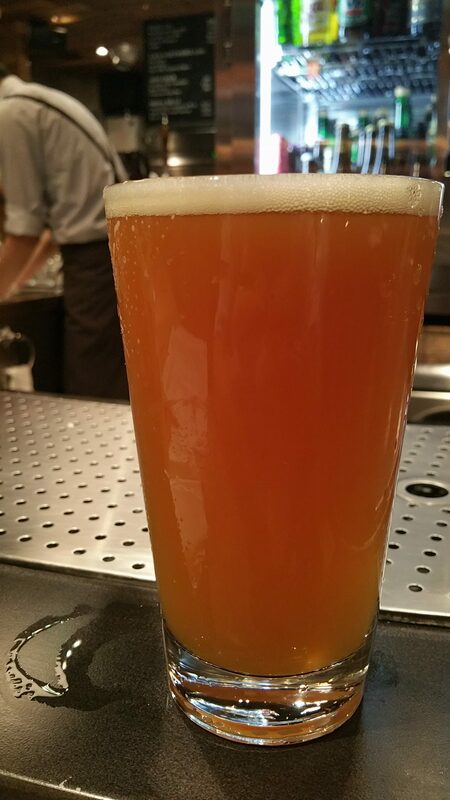 Yokohama YABAcious IPA poured out a hazy dark orange colour with a light frothy white head that disappeared quickly. Yokohama Beers, well their bottled range at least, have had quite muted aromas so to smell something so dank and piney from them it highly unusual. It was so potent I had to ask the bar manager if he had actually given me the right IPA and he laughed. Yokohama YABAcious IPA had lashings of passion fruit, citrus lemony aromas, and some sweetness, but that dank piney resiny aroma could not be shaken from the nose. Admittedly, this pint of Yokohama YABAcious IPA was fresh off the keg, having been tapped that day, so I can only imagine that these aromas may fade over time. New England IPAs seem to be the fad in the IPA world at the time of writing, with the hazy style combined with an orange-juice-like look appealing to drinkers, and with Yokohama YABAcious IPA, it seems that Yokohama Beer have taken the same route. While there was a bitterness present from the get-go, the flavours pounced out of the glass without abandon – passion fruit, lemony tones, and some juicey peaches came flooding out, along with the dank piney resiny goodness. It wasn’t as crisp or as dry as perhaps an American IPA usually is, but the flavours are just too much to not enjoy. Yokohama YABAcious IPA should be on your list of beers to try fresh – which is perhaps the downside of drinking a beer like this – who knows how the flavours will be when the keg gets old.